As spring approaches I have begun looking into a small bathroom update at the house. All I am doing is replacing the shower surround, and tub, and the shower fixtures. As I started looking at fixtures by Lacava, which is still at the top of my list, I came across the new Adesso product line which is what I have for a faucet at my kitchen sink. So after a bit of research, here is a post about this elegant line of fixtures which is now number 2 on my list. From the smooth curves of Rana to the intrepid lines of Anggolo, Adesso manages to transform everyday bath fixtures into something more transcendant. Adeso has found an equilibrium between design and architecture evolving a simple bathroom faucet into a work of art. Encapsulating bold accents, and distinctive lines, each piece is painstakingly crafted to bring a piece of Italian style to your home. Choosing not to follow typical European design trend for creating unique design at the expense of functionality, Adesso incorporates the best of both worlds. 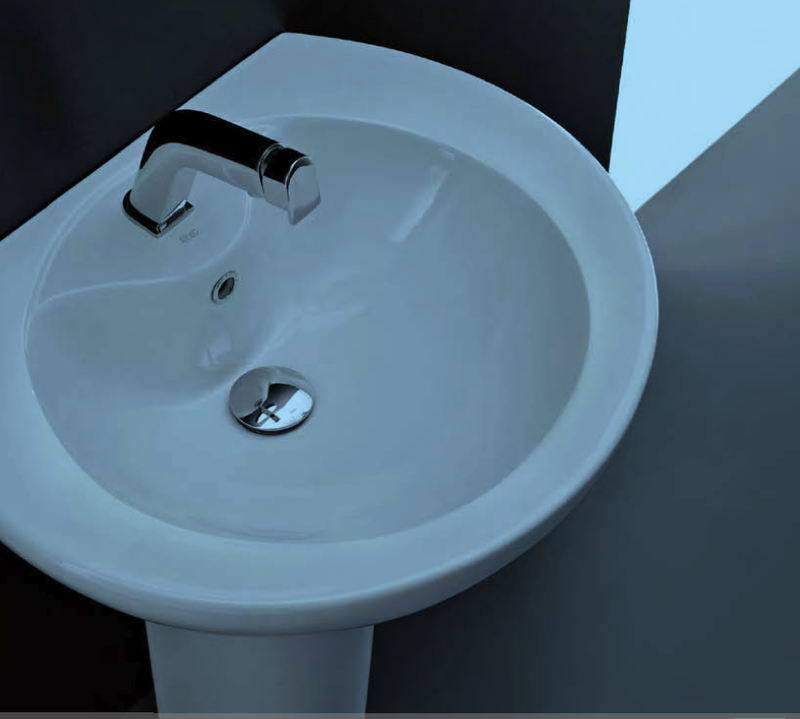 The recently expanded range shows clever designs and simple functionality for everyday home use. Adesso’s new line consist of 5 product ranges — Mila, Angolo, Cielo, Rana, and Lucerne — Adesso’s impressive design pedigre is most notable with Mila. 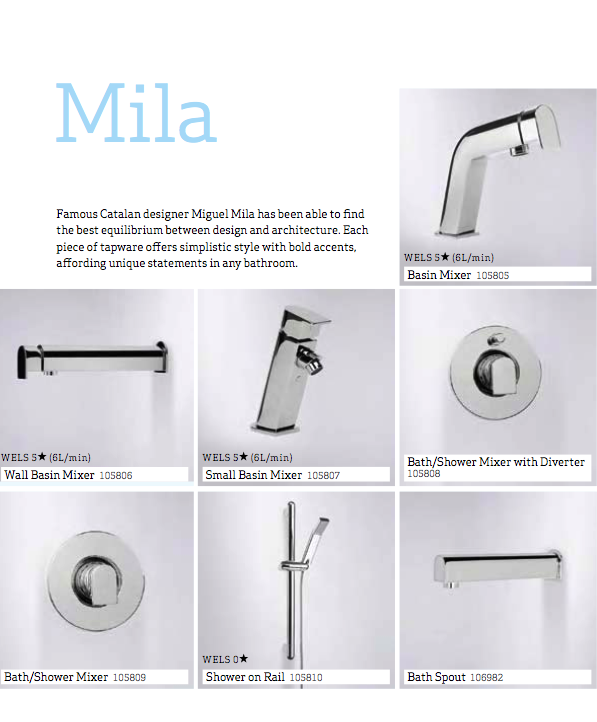 Named after and designed by recognized Catalan designer Miguel Mila, the range offers simplistic style for a unique statement in any bathroom. Subtle and chic, Mila’s soft yet defined lines are captivating and seductive creating an aesthetic appeal that is so representative of Italian design. Rana and Cielo are the smallest of the Adesso lines. 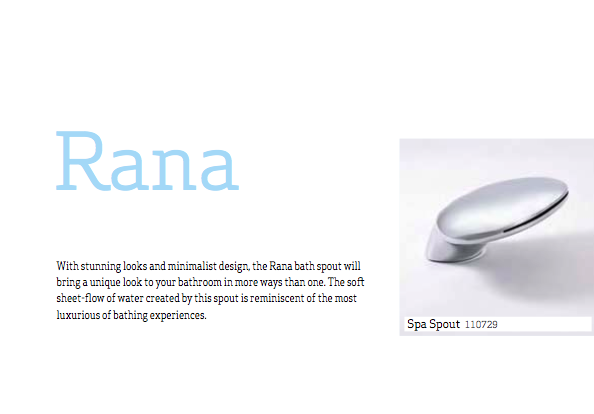 Rana is a dedicated bath faucet, and Cielo fulfills the shower components. Both are aesthetically pleasing through stunning looks and minimalist design, the Rana faucet displays a unique look in more ways than one. While the smooth curves and elegant form of Rana are fitting for any contemporary bath, it is the soft smooth sheet of water it produces that creates a stunning visual appeal for the fixture. 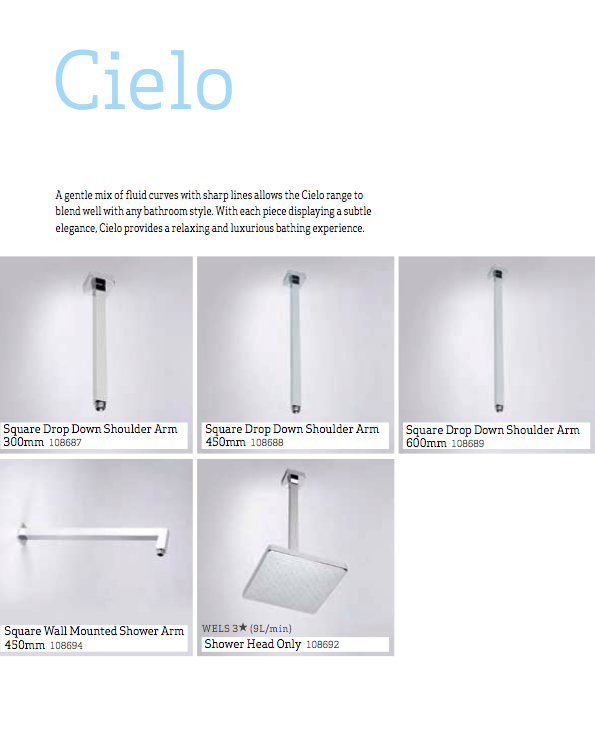 The versatility of Cielo shower components integrate into any contemporary bathroom with square shower heads, and a range of shower arms. Cielo offers a mix of fluid lines and sharp angles with a balance of elegance and modern style. The square shower head incorporates modern design trends with a slim line aerator that delivers a smooth stream of water delivered through 145 outlets. 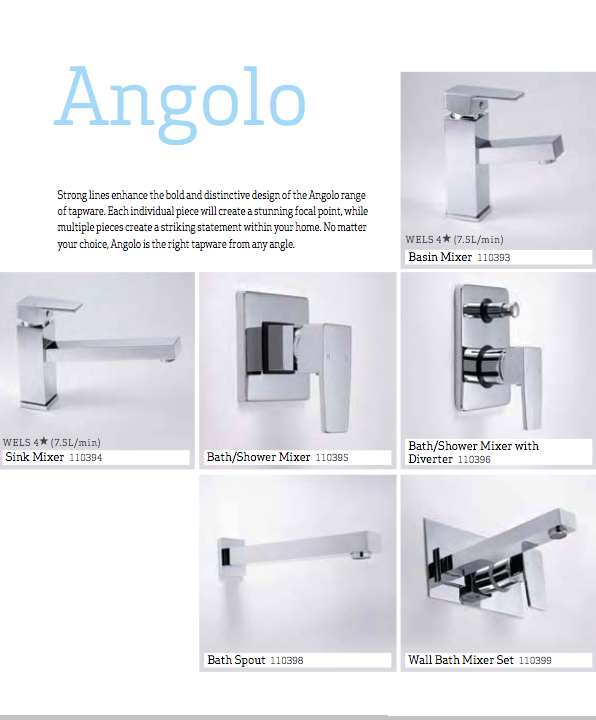 Through striking appearance and distinctive design, the Angolo product line is a range evoking power. Despite its minimalist character, each edge has been sculpted to create a bold statement. The Angolo line expands beyond bathroom fixture with kitchen faucets designed to match and compliment the rest of the line for your home. 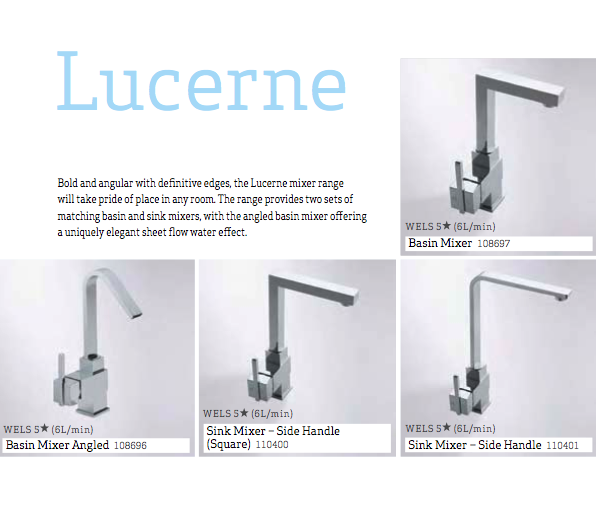 The Lucerne range is made up of 2 bold handled faucets featuring angular forms, one set is hard the other soft. The smooth spout of the angled faucet offers a sheet flow water effect to your basin that looks like a plane of glass rolling from the metal opening downward in a perfect arc. The line is available online and through most fixture suppliers that carry high-end fixture. Posted in Design and Art and tagged Adesso, Bathroom Fixtures, Faucet, Lacava on January 17, 2010 by Author. ← Design Friday, Clifford Ross Hurricanes.